Wine tours are one of the most popular visitor activities throughout the Finger Lakes, with the first crushing of the grapes usually occurring in mid-August and the harvest continuing as late as January for the treasured ice wines. The Inns of Aurora offer a Wine Country Getaway package that includes the opportunity to experience world -class wines, gorgeous scenery and fresh regional cuisine including a six-hour wine tour in a luxury sedan. Alternatively, if you want to create your own custom itinerary, visit any or all of Cayuga County’s 11 wineries on your own and enjoy world-class Riesling, Cabernet Franc, Chardonnay, Pinot Noir and many other varietals in the comfort of a cozy tasting room. The Cayuga County Office of Tourism has plenty of free maps to help you can plan your tour. A great way for the whole family to enjoy the harvest season in the Finger Lakes is with a visit to one of the many U-pick farms. There’s nothing like taking a wagon ride into an orchard and picking apples fresh from the tree, or scouring a pumpkin patch for the perfect pumpkin for this year’s jack-o-lantern. If you want that fresh-picked taste without the work, stop at one of the many farm stands dotted throughout the county or visit the weekly farmers markets held in Auburn, Moravia, Port Byron, Aurora, and Owasco. In addition to fresh fruits and vegetables, local eggs, homemade baked goods, farmstead cheese, jams and jellies, herbs and honey are also available at most farmers markets. Fall is a wonderful time to taste the local flavors of the region by having a meal out at one of the fine restaurants that make buying local a priority. You can eat local at the Aurora Inn, Elderberry Pond Restaurant, Moro’s Table and Oak & Vine at the Springside Inn. Their chefs all value the fresh flavors that buying local adds to any menu. Pairing a dish made with local products with a Finger Lakes wine is the ultimate way to get a taste of the Finger Lakes. You can also enjoy the harvest with one of the many harvest related events held throughout Cayuga County. Treleaven by King Ferry Winery holds a two-day Harvest Festival October 7 & 8, 2017 that includes traditional grape stomping, pumpkin painting, lawn games and live entertainment plus local food trucks and of course, wine! In northern Cayuga County, Colloca Estate Winery hosts the Lake Ontario Food and Wine Festival on October 14, 2017. Enjoy great food and samplings from seven Lake Ontario Wine Trail partners, along with live music and NYS craft beers as you overlook beautiful Fair Haven Bay. 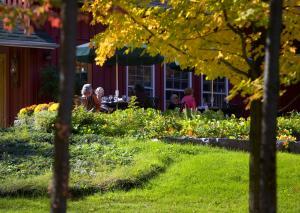 Fall is truly a fabulous time to visit New York’s Finger Lakes Region!